Since I wrote about Whitehall Palace yesterday and mentioned one of its owners, Thomas Wolsey, I thought I’d stick here in W for a minute and go a little more in depth about Mr. Wolsey, his amazing rise to status and his total and swift downfall. Thomas was born the son of a butcher in England in March 1473. In his twenties, he studied theology, eventually becoming a priest and a chaplain to the Archbishop of Canterbury. In 1509, he went to work for King Henry VIII. That’s where the fun begins. Keep in mind, young Henry was only 18 years old at the time, and I’m sure the 36-year-old Wolsey figured he’d lead the king in righteousness with his mature and prudent ways. Things went along rather well for Wolsey. You saw his house in the Whitehall Palace blog. Obviously, he was well taken care of by the king. Having the young king’s ear, Wolsey quickly became the controlling force behind all matters of state, and when Pope Leo X appointed Wolsey Archbishop of York in 1515, he became the second most important cleric in England. Henry even appointed him the highest political post possible – Lord Chancellor – which is the king’s chief adviser. Things proceeded well for about a decade, but Henry was young, egocentric, and distraught by the fact that his wife Catherine had not delivered him a son and heir. Catherine was older than Henry and nearing forty, Henry didn’t think he’d get a son out of her, and I imagine his bitterness grew. Simultaneously, he met and fell in love with another woman, Anne Boleyn, and he decided to rid himself of his wife. But how? He couldn’t have her killed. He couldn’t just sent the queen away. He’d have to divorce her, but divorcing someone meant you couldn’t marry another. That wouldn’t work. There was only one thing to do. He’d have the marriage annulled. There was only one HUGE problem. The Pope refused to annul his marriage to Catherine on the grounds that one can’t throw away a wife because one desires a different wife. Well, Thomas Wolsey is so important in the church, let’s let him handle it. Surely he can convince the Pope to grant an annulment, especially for the freakin’ KING. OF. ENGLAND. The divorce went on for years, and each passing message that Wolsey was getting nowhere with the Pope, enraged Henry even more. All for the love of Anne, Henry decided to split from the Catholic Church and become his own religious leader in his own newly formed Church of England. He would grant his own divorce and get rid of his wife. He also decided to get rid of the useless Wolsey. Anne had convinced Henry that Wolsey was slowing down the proceedings on purpose. In 1529, Wolsey’s fall from grace was sudden and total. He was run out of town and stripped of all his titles except Archbishop of York. Within the year, Catherine was banished from the court. Wolsey was charged with treason and faced beheading. Fortunately for him, he died of natural causes en route to London to answer to the charges. Henry confiscated Wolsey’s Whitehall Palace and married Anne there in 1533. If all that isn’t sick and twisted enough, Henry had Anne beheaded three years later. Most people around the world know the Statue of Liberty as a symbol of American freedom. Most Americans know it was a gift from France, but it wasn’t…more on this later. The statue was completed in France in 1884 and arrived in NY Harbor in 1885 in 350 pieces packed in 214 crates. It took four months to reassemble her, and on October 28, 1886, President Grover Cleveland performed her dedication in front of thousands. …her dedication was protested by women who as of 1886 did not yet have the right to vote. In their eyes, raising a statue of a woman as the symbol of freedom was absurd. …she wasn’t originally supposed to come to America. The designer Frederic Bartholdi (photo), originally proposed that she stand at the entrance of the Suez Canal as a lighthouse, but the deal fell through, leaving Bartholdi to find another home for her. …she was supposed to honor American freedom and commemorate the 100th anniversary of the American Revolution of 1776. She finally arrive in 1886, a decade late. …she was supposed to be a lighthouse, thereby eliciting government funding, but the powers-that-be decided to place her too far inland to do any good as a beacon. She was also supposed to be gilded with gold, but after how much money it took to erect her, the people with the deep pockets decided against it. …okay, back to the France part. She was built in France, and Bartholdi did everything he could do to get government funding, but they refused. Finally, through fundraisers and donations, the people of France put up $250,000. That’s about $2.5 million in today’s money. Bartholdi spent a decade raising money to finish her, but Joseph Pulitzer, the American newspaper magnate, is the one who finally raised enough money from his American newspaper readers to have her shipped and erected. Most people think of quilting as making a bed cover, but it’s so much more. Quilting is a sandwich – a top layer of cloth, a layer of padding, and a bottom layer of cloth. It can be as thick and as intricate as one wishes. Quilting dates back to ancient Egypt. As far back as the 12th century, quilting was used to make garments worn under armor. One of the earliest surviving quilts was made in Sicily around 1360. Pieces of it are in museums in London and Florence. Quilting in America began in the 18th century. Women spun, weaved, and sewed clothing for their families. Quilts for beds were also made out of necessity. Until 1840, looms were not large enough to produce a piece of cloth that would cover a bed, so strips of cloth needed to be sewed together. Using the same cloth was known as ‘whole cloth’ quilts. Contrary to what many of us would think, quilts were not made of left-over scraps of cloth and old pieces of clothing. They were instead examples of the fine needlework of the quilter. Once looms were large enough to produce large pieces of fabric and became common enough and cheap enough for the average person to afford, women didn’t have to spin and weave anymore. Readily made fabrics changed the look of quilts. They began to contain different fabrics and the ‘block’ quilt was born. During the 1850s, Singer mass produced a sewing machine and made it affordable with payments. By 1870, most homes owned one. This was a huge time-saving tool that made clothing one’s family easier and afforded women more time to quilt. The art of quilting was once an important part of a woman’s life, but over time, it has become mainly a hobby. The amount of time and materials that go into a quilt make it very expensive to produce, so most quilts are passed down through families. I love quilting, though I admit, I’m not very good at it. My grandmother was a professional seamstress, but I didn’t inherit that ‘fine needlework’ gene. Regardless, I enjoy it, and I’m currently working on the quilt pictured here. It is a Vin Du Jour pinwheel quilt, if you’d like to know. I got all the pieces cut out and you can come back in a couple million years and see the finished product. There are about 600 pieces in this darned quilt. If anyone out there has a smidgen of time to help me, that would be great! I’ve been participating in the “52 Ancestor” challenge all year, following along with the weekly themes and having a great time. BUT…I work out of the country for months at a time and generally write and schedule the blogs in advance. APPARENTLY, someone has dropped the ball in getting the October themes posted. As I type this in the real word today is Sept 24 and I leave for the month of October on Sep 26. I have today and tomorrow to write and schedule October’s ancestry blogs. SO, I’m forced to blog without themes. Guess we’ll have to combine the two for the month of October. 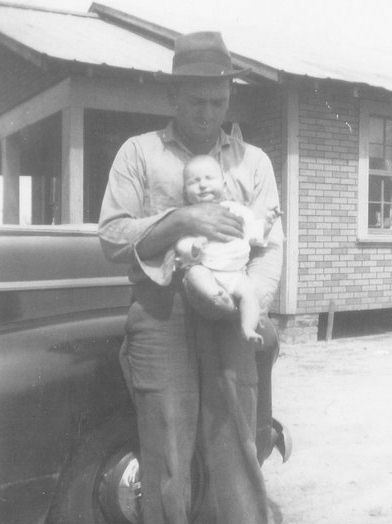 James Otis Burke (photo with infant son), whom we loving called Uncle Otis died on this day in 2003. He was my grandmother’s younger brother, my great uncle, born 14 Feb 1922 to John Patrick Burke and Mary Elizabeth Howington. He was the middle child of seven children, one who died as an infant. He was born and raised in Little Rock, Newton County, MS. There’s not much in Newton County but farmland, but the city of Meridian isn’t far away. In 1941 at the age of 19, he served in the United States Army during WWII. When he returned from the war, he married Luna Marie Arledge and they had three children. One boy and two girls. I remember my mother speaking of her cousins so lovingly. They were products of the 50s generation. I’m sure they spent many nights at the drive-in in town, and I picture them hanging out together just like the “Happy Days” TV show. 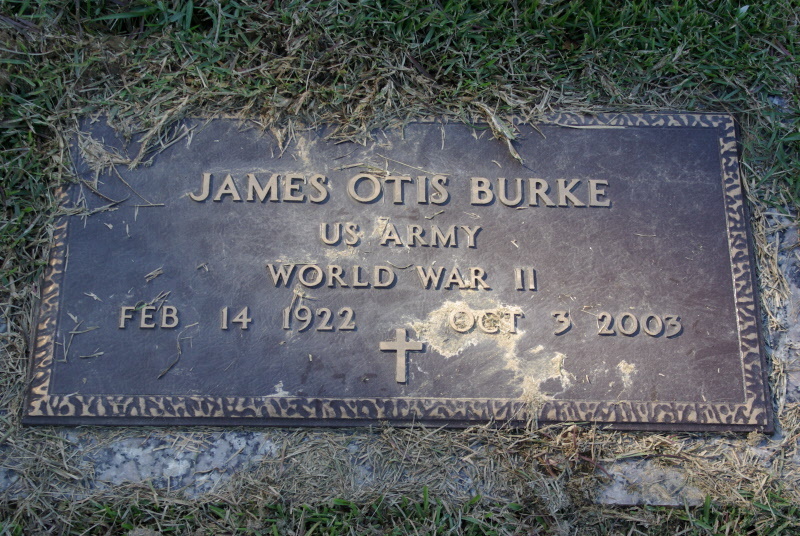 Uncle Otis buried his wife in 1990. She died at the age of 66. He never remarried. 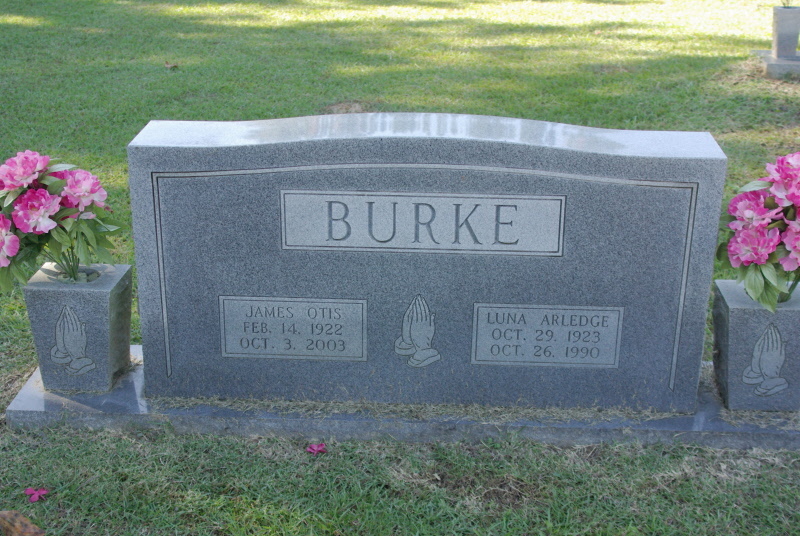 He died on October 1, 2003 at the age of 81 and is buried with his wife at Pleasant Grove Baptist Church Cemetery in Newton County.